Cropped image. Paul Hamilton, Flickr. CC license. I’ve been speaking about play and reading to parent groups for many years. I’m not a teacher or reading expert by any means, but it’s been very easy and fun to be an advocate for the importance of reading to (and with) children. Many of us already know the value of reading and I always ask my groups, “Why should we read to our babies?” The answers are plentiful: brain growth, cognitive connections, vocabulary development, language skills, bonding, fun, etc. Not everyone has such a memory, but those who do often remember the books as well, such as Berenstain Bears, Golden Books, Dr. Seuss, Shel Silverstein, etc. And there is always an obscure title mentioned with a smile and a brief nostalgic nod. Family trips to the library. Saving an allowance to buy a book. A special book that only grandma reads with them. Planned reading time together, taking turns reading to each other (especially good for older children). Talking about favorite books at dinnertime. A book exchange with neighbors and friends. It’s hard to predict what memories will linger as we grow into adulthood, but these activities are valuable even if long forgotten. – Betsy Clancy is a group coordinator for the Beaumont Parenting Program. Many of us can remember a favorite book from our childhood. Perhaps it’s one you read again and again. Maybe you’ve even shared it with your own child. So what is it about a children’s book that sticks with us even as we get older? Sometimes it’s a character who makes us care about him, like Curious George, or one that the reader can relate to for some reason. It could be the illustrations that help bring a story to life. Books can even teach us lessons or concepts; how many of us remember reading “One Fish Two Fish Red Fish Blue Fish” by Dr. Seuss? And of course, there are a good number of adults who enjoy reading children’s and young adult literature for the pure enjoyment of the story! From bedtime books to chapter books for older kids, here are some favorites of our Parenting Program staff and their children. As a parent, choosing chapter books can seem foreign when it comes to our beginning readers. 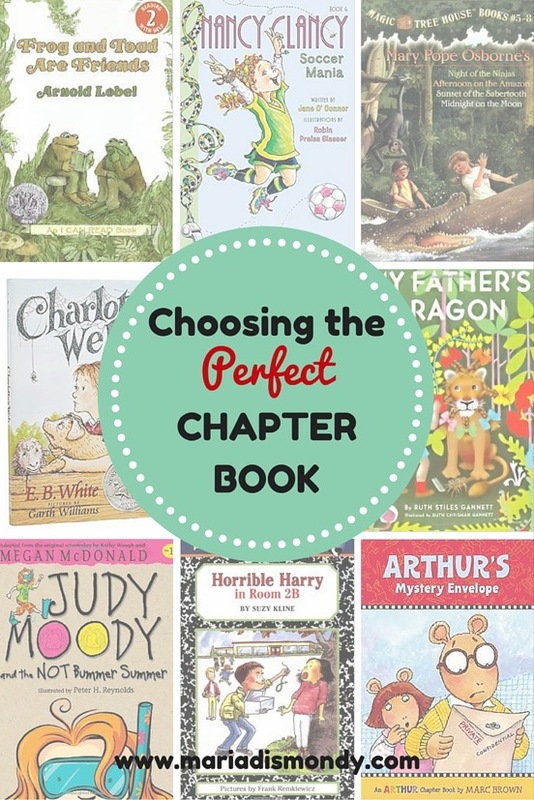 In this blog post, I want to help open your eyes to the wonderful world of chapter books and give you a simple system to choosing the perfect book for your child. Chapter books give children stories that are filled with elements such as character development, plot, problem, solution and more. Because of the length of chapter books, they help build a child’s reading stamina. Children also develop new vocabulary from reading more challenging books. The most difficult part for children reading chapter books is either the fluency (pace and ease of their reading) or the comprehension (ability to recall the details and events in the story.) This is one reason why finding the perfect book is so important for your children. If you choose a book that’s too hard for their reading level, they may not enjoy reading because they have to work so hard to read the words on the page. This can be detrimental to the love of reading they’ve come to understand. Also, a book that’s too difficult could have situations in the storyline and language that’s too mature for your child. As my daughter is reading more and more and I am having a hard time “previewing” her chapter books, I am reading reviews on them on either Shelfari or Good Reads to check the appropriateness of the content. This is the first set of chapter books your child will be able to read and comprehend. The shelves at local stores like Target and Walmart are stocked with this genre of Early and sometimes called Easy Readers. I hope this helps you in choosing the perfect books for your children. Don’t forget to use the resources out there in helping you find new titles. Pinterest is great for finding a group of titles like “Chapter Books with Mystery.” Happy Reading! – Maria Dismondy, mother of three, reading specialist, fitness instructor and bestselling children’s author living in Southeast Michigan. Visit www.mariadismondy.com/resources and join our Private Facebook Group where parents and educators are collaborating to empower children with skills and strengthen their character and esteem. Cropped image. Mliu92, Flickr. CC license. For a over a year now I’ve been writing for Beaumont’s Parenting Program blog on ways to encourage reading and writing through the use of books in your home. But have you ever thought of using books simply for play? Here’s how! Book Doctor. Use tape to help your children help fix their broken books. A torn page can be recovered in just minutes using clear packaging tape. If you don’t have broken books pulled aside just yet, make a label for a basket that can be kept near your family library to collect broken books over the next few weeks. Build a Book Tower. Stack books. Talk about which ones work best (hardcover) and challenge each other to see how high your tower can get! Home Library. Set up a check-out system for your home library. You can make pretend library cards using index cards or print one off the internet like this one. Don’t forget that local libraries have story time. Your children can grab a book, a chair and some stuffed animal friends to play the role as children as they retell a favorite story to an audience! Design a Bookstore. A few weeks ago my girls set up books in the playroom with signs labeling groups of books (books with animals, Disney books, etc.). Then they played bookstore with one of them working the register at the store and the other coming through with a shopping cart and collecting books. Go on a Book Scavenger Hunt. This can be done in your personal family library or the local library. Here is an awesome printable to guide this play activity! This year my family and I sat down and came up with goals/resolutions. I love to read. It brings me so much enjoyment but when I get busy, it’s the first thing I put on the back burner. So I made the resolution to read a book a month. Then I started thinking about making a list of chapter books my girls would like to read (or classics I would like to read to them) with us this year. If we list them and post the list on the fridge, we’re more inclined to use this visual as a reminder and follow through! Here are some of my all-time favorite chapter books for children ages 3 – 7. My 3 year-old is just starting to sit through longer books so I think one chapter per night is all we’ll do. Remember it’s important to think aloud, ask questions, and retell what’s happening in the story. Encourage your children to do the same in order to increase their reading comprehension. Get conversations going about your books and it’ll not only be a family moment but a learning one too! Cropped image. Gracie and Viv, Flickr. CC License. Did you know you can truly impact your child’s literacy development with just a few questions every evening before bed? It’s true. Let’s keep it simple with this month’s tip. Here’s a sure-fire way you can increase your child’s reading comprehension, which they will develop before they are reading words. As you read the story or afterwards, ask your child to identify the story elements: characters, problem, solution, and setting. Your child will get really good at listing the above elements. Once this happens, add in more challenging story elements: the author’s message/theme, and the sequence of events. For the sequence of events, have your child retell the story across their fingers (i.e., First the boy while holding up one finger. First, next, then, last.). Go ahead, admit it, you’ve had something to eat or drink recently that was flavored with pumpkin spice. It’s become a part of the fall weather tradition around here in Michigan. As I sit here and drink my pumpkin spice coffee, I wanted to share some creative ideas on how you can pair up books with other unique gifts for birthday or holiday celebrations. Name Books. Search Amazon for books that include the child’s name in the title. Children love hearing their name mentioned over and over again in a book. I just did this for a first birthday gift. I picked out three or four books with the character name “Lucy” in them for a sweet little girl. Book and Stuffed Animal. Put together a book with a stuffed animal of the main character. We received this gift recently and especially loved the Ladybug Girl book collection. Book and Toy. One of my favorite titles that encourages childrento be themselvesis called The main character is an elephant and the book is a great fit for preschool and elementary-age children. Pair it up with a puzzle for a creative bundle! Themed Baskets. Pick out two or three fall books. Add them to a basket (Home Goods has great canvas baskets) along with some candy corn, hot cocoa, marshmallows and a mini-sized pumpkin. This can be switched up for any season and for any holiday. When our son was born, a friend filled a navy blue and white canvas tote with nautical themed gifts and books. It was a really fun gift to receive and I hope to give some out in return! Fall Books. Check out my blog post from last year with ideas on fall books.